Check out some new photos Oona shot for Constellation Magazine, shot by the amazing 17 years old Photographer "Zayira Ray". Also check out some new Event Pictures from the Build Series Discuss of Little Boxes!! Check out some new exclusive Images from Oona and Bryce Dallas on Set from "Pete's Dragon". Credit to BryceDallasHoward.co for all the Images. Hey everyone! Welcome back to Starlight Oona Laurence. This is our first post and we got some screencaps from Oona in "Pete's Dragon". She plays Natalie. It's about the adventures of an orphaned boy named Pete and his best friend Elliot, who just so happens to be a dragon. You can download the Movie on iTunes and Amazon. Just click down below on the Images to head over to our gallery. You can download the movie on iTunes, Google and Amazon. Just click the Images down below or click here to head over to our Gallery. Happy Holidays & New Photos!! Hey people, we wish all of you Happy Holidays. We hope you all had a awesome Christmas. We also wish you a happy start in 2017. Be safe! We currently working on a new theme for 2017. Not sure when it is coming up! 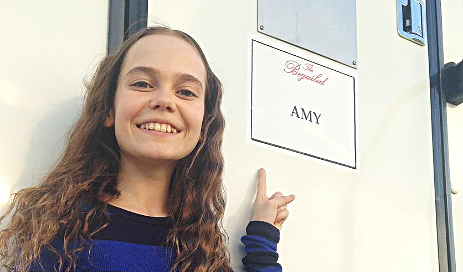 Oona just announced on her Instagram that she is going to be a Part of the New Movie called "The Beguiled" as Amy. Elle Fanning, Kirsten Dunst, Nicole Kidman and Addison Riecke also will be in the Movie. The Movie will be out around June 30th, 2017 (USA). Come back for more soon!! Imaginapped, Lyrics for Life and more! Check out a couple new Photos. We added some new Movie Stills, Official Movie Poster and a BTS's from Oona's Short Movie called "Imaginapped". They some Event Images from Oona attending the Launch Party for Unscripted and Oona and her Sisters entered the Lyrics for Life hosted by Mackenzie Ziegler and Casey Simpson. Just head over to our Gallery!! August 8th, 2016 was the World Premiere of "Pete's Dragon" in the El Capitan Theatre in Hollywood. If you haven't checked the official trailer yet then just click here. Pete's Dragon is in Cinema now! Click here to check when the Movie is out in your Location. New Mini Site for Oona's Sisters Jete & Aimee! Like we said in the previous post. From now on we also present News, Updates from Oona's Sisters Aimée & Jeté! Thats why we created a Mini Fansite for them. It can be found at AimeeJete.Oona-Laurence.com you can get to know them both a little better! We hope you like it. Hey! Today we got some exciting things. First we added some brand new HQ Headshots, shot by Laura Lu.Thanks to Emily for sending them to us. From now on we present any news from Oonas Sisters Aimee and Jete Laurence! Check our Gallery for the new "Oonas Sister" section! We added a cupple of Photos. Let's see what the future brings you!